An exclusive directory of leading suppliers of products and equipment to the world's Navies. • PLUS — A wealth of current marine business and technical information first — weeks before the slower monthlies. PLUS — A wealth of current marine business and technical information first — weeks before the slower monthlies. Houston, Texas — April 25 - 27 • PLUS — A wealth of current marine business and technical information first — weeks before the slower monthlies. Washington, D.C. • Special AWO INDUSTRY Reports • U.S. INLAND WATERWAYS YARDS - A Review • ® PLUS — A wealth of current marine business and technical information first — weeks before the slower monthlies. Meeting and Symposium. • Special NAVY Article • PLUS — A wealth of current marine business and technical information first — weeks before the slower monthlies. Survival and safety systems and equipment review. • PLUS — A wealth of current marine business and technical information first — weeks before the slower monthlies. 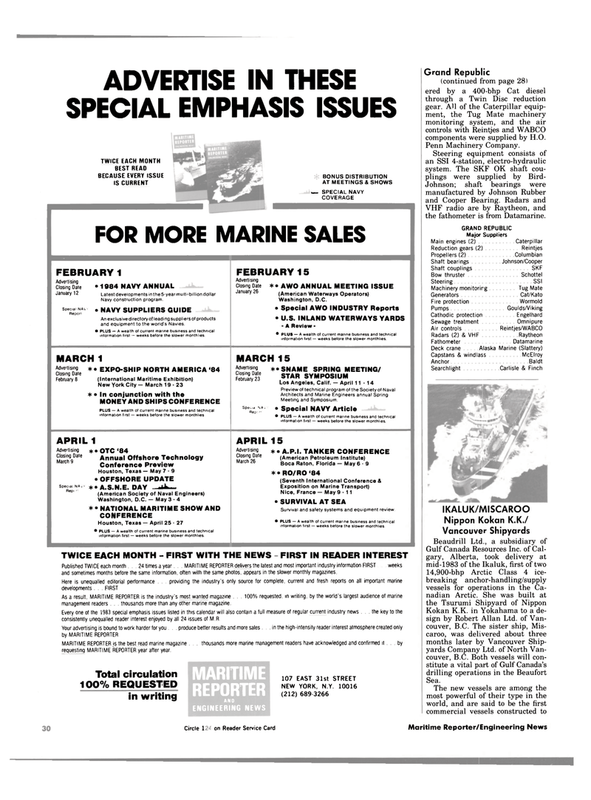 Published TWICE each month 24 times a year MARITIME REPORTER delivers the latest and most important industry information FIRST and sometimes months before the same information, often with the same photos, appears in the slower monthly magazines. As a result, MARITIME REPORTER is the industry's most wanted magazine 100% requested, in writing, by the world's largest audience of marine management readers . . thousands more than any other marine magazine. MARITIME REPORTER js the best read marine magazine . thousands more marine management readers have acknowledged and confirmed it by requesting MARITIME REPORTER year after year. Grand Republic (continued from page 28) ered by a 400-bhp Cat diesel through a Twin Disc reduction gear. AH of the Caterpillar equip- ment, the Tug Mate machinery monitoring system, and the air controls with Reintjes and WABCO components were supplied by H.O. VHF radio are by Raytheon, and the fathometer is from Datamarine.